Mark: You have to come out now. There's no way out, filthy little pig! Alright, fine. "Incredible" is a bit of a stretch. Terrible, on the other hand, pretty much tells the entire story, here. In its defense, I have most certainly seen worse. Not a helluva lot worse, mind you, and not too terribly often. 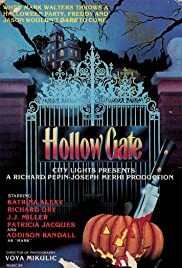 Although, Hollow Gate is really, very quite terrible, I didn't find it to be unwatchable, and it an't event that boring. And, at times, this movie even makes a little sense... A little.